It’s probably a good thing that we’ll never know what they really think! However, that’s not to say that we can’t understand their wants and desires. Cats try to communicate with us all the time, all you need to do is know how to read the signs. By paying attention to your cats’ body language and behaviour, you can learn an awful lot – as well as strengthening your bond and enjoying a beautiful mutual relationship with your little furry companion. 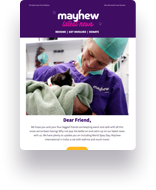 Mayhew’s Cat Welfare Coordinator, Georgina Costi, shares her expertise. Contrary to popular belief, when a cat lies on its back with its belly exposed; this isn’t an invitation for you to give them a tummy rub. For the most part your cat is letting you know that they feel safe in your company and that they would like your attention. Your best reaction to this kind of behaviour is to give them a good scratch on the neck or behind the ear! Of course your cat is probably quite a big fan, but this isn’t their way of showing you. What they are actually doing is ‘scent marking’. Remember that you are your cat’s property and when you’ve been out of the house for a while, they need to make sure that you ‘smell right’ when you return. That being said; if they stroll over to you with their tail in the air and their head held high, this is a clear sign that they are pleased to see you. Just as humans have to clip their nails, cats like to keep their claws trim as well. That being said; cats also use scratching to mark their territory and to enjoy a good stretch! This isn’t bad behaviour, so you should not treat it as such. If you don’t want your cat to scratch your new sofa then you should invest in a handy scratch post for them to enjoy. For the most part, cats meow to provoke a reaction. They’re much smarter than we give them credit for and have learned that we humans simply cannot resist their darling chatter. Take notice of where your cat is when they meow. If they’re stood near their food bowl, this is a clear indication that it’s dinner time. And if they’re outside your bedroom door, they likely want your attention. If on the other hand, they’re constantly meowing, and it sounds a little different to their normal chirps, it could be that they’re trying to tell you that they’re poorly. If you’re uncertain, call your vet! If your cat is usually very social and comfortable sleeping in the open, then watch out for this change in their behaviour: hiding more often than usual. While it’s not unusual for cats to sleep in little nooks that they find; it can also be a sign of sickness. If a wild cat were to show weakness it could be life-threatening, which is why they would otherwise make themselves scarce. Domesticated cats act in a very similar way. Any sudden changes in your cat’s behaviour is a classic indication that they’re either stressed or in pain. If you have any doubt’s, do not hesitate to get in touch with your vet. When your cat blinks slowly at you, it’s because they feel comfortable in your presence. If you want to tell them right back, return the gesture. Just try not to stare because this could spook your cat and be seen as threatening behaviour! In addition to that they might softly nibble on your nose which is a sign of affection, whilst also subtly reminding you who’s boss. How does your cat communicate with you? We’d love to read all about your tales on our Facebook page!